Keeps you hydrated. 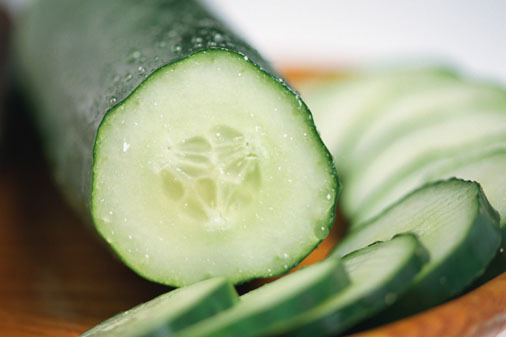 If you are too busy to drink enough water, munch on the cool cucumber, which is 96 percent water. It will cheerfully compensate! Fights heat, both inside and out. Eat cucumber, and your body gets relief from heartburn. Apply cucumber on your skin, and you get relief from sunburn and itchy skin. Flushes out toxins. All that water in cucumber acts as a virtual broom, sweeping waste products out of your system. With regular use, cucumber is known to dissolve kidney stones. Nourishes you with vitamins. A B and C, which boost immunity, give you energy and keep you radiant. Give it more power by juicing cucumber with carrot and spinach. Supplies skin-friendly minerals: magnesium, potassium, silicon. That’s why cucumber-based treatments are popular in spas. Aids in weight loss. Enjoy cucumbers in your salads and soups. My favorite snack? Crunchy cucumber sticks with creamy yogurt dip. Revives the eyes. Placing chilled slices of cucumber on the eyes is a clichéd beauty visual, but it really helps reduce under-eye bags and puffiness. Cuts cancer risk. Cut down your risk of several cancers by including cucumber in your diet. Several studies show its cancer-fighting potential. Stabilizes blood pressure. Patients that struggle with blood pressure, both high and low, often find that eating cucumber brings relief. Refreshes the mouth. Cucumber juice refreshes and heals diseased gums, leaving your mouth smelling good.